The Woodstock festival of 1969, which featured such groups and artists as the Who, Country Joe and the Fish, Ten Years After, Janis Joplin and Jimi Hendrix, is remembered as much for its 'bringing together' of the counter-cultural generation as for the music performed. The event represented a milestone in the use of music as a medium for political expression while simultaneously acting as a springboard for the more expressly commercial of rock and pop events which were to follow. In the thirty years since the festival took place, Woodstock has become the subject of many books, magazine articles and documentaries which have served to mythologise the event in the public imagination. These different aspects of the Woodstock festival will be discussed in this wide ranging book which brings together a number of established and new writers in the fields of sociology, media studies and popular music studies. Each of the five chapters which will focus on a specific aspect of the Woodstock festival and its continuing significance in relation to the music industry, the rock festival 'tradition', sixties nostalgia and the cultural impact of popular music. Contents: Introduction, Andy Bennett; The three Woodstocks and the live music scene, Dave Laing; '1, 2, 3 What are we fighting 4?' Music, meaning and 'The Star Spangled Banner', Sheila Whiteley; 'This is your Woodstock': popular memories and political myths, John Street; 'Everybody's happy, everybody's free': representation and nostalgia in the Woodstock film, Andy Bennett; Reporting Woodstock: some contemporary press reflections on the festival, Simon Warner; The contradictory aesthetics of Woodstock, Allan F. Moore; 'Unsafe things like youth and jazz': Beaulieu jazz festivals (1956-61), and the origins of pop festival culture in Britain, George McKay; A public transition: acoustic and electric performances at the Woodstock festival, Dave Allen; Still picking children from the trees? 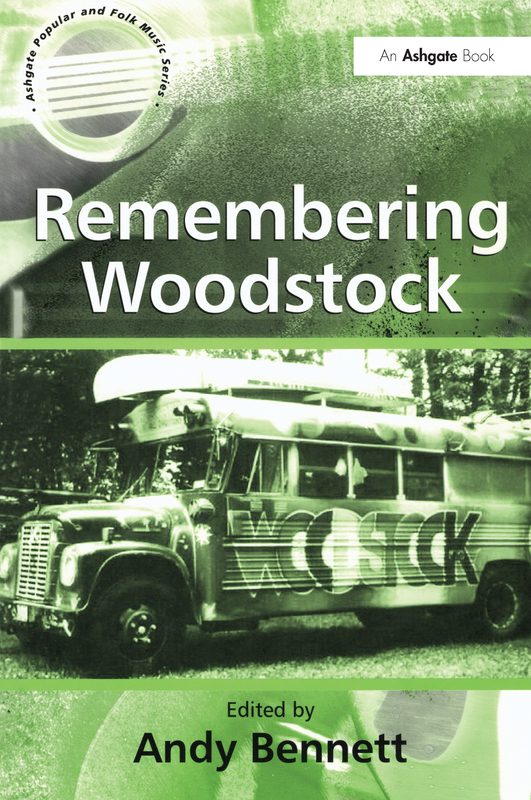 : reimagining Woodstock in 21st century Australia, Gerry Bloustien; Afterword: Country Joe McDonald remembering Woodstock, Country Joe McDonald with Dave Allen. Index.